Love is a Battlefield in this week's quiz! Lock and load, soldier! 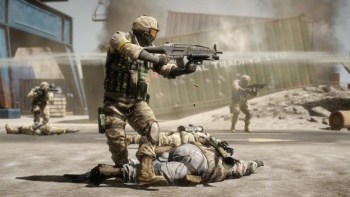 Battlefield 3 launches tomorrow, and in celebration of the highly-anticipated shooter we've put together a quiz covering the entire Battlefield series. From fighting the Battle of the Bulge in Battlefield 1942 to the bipedal combat walkers of Battlefield 2142, from the fierce jungle warfare of Battlefield: Vietnam to the gold-stealing boys from the 222nd Army Battalion in Bad Company, this quiz covers it all. Time to dust off your old M1 Garand!